I think that I am the kind of person that is a pretty good mix of Right and Left Brain. That might explain the constant battle that I fight with myself. I long to be an organized and orderly person, but no matter how much I try my organization efforts always prove to be unsuccessful. I'll spend a day rearranging the boxes where my craft things are stored, but it seems that by the time I finish my next craft project things are a mess again. I don't know how it happens, but it inevitably does. 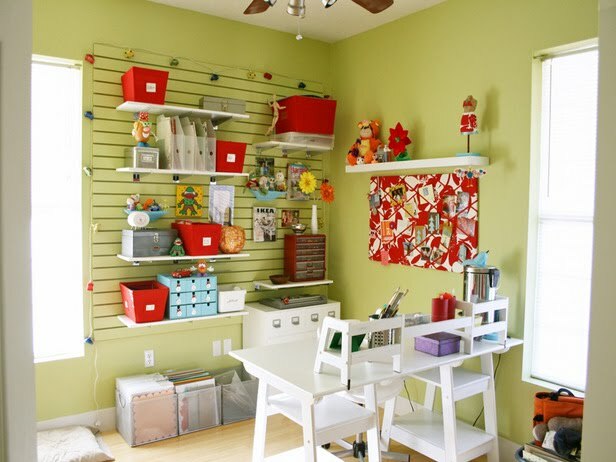 So I have decided that it is time for a craft room update...if only I had a craft room. Like many of you my "craft room" is a shared space, and is in no way dedicated to crafting. Most of my supplies are stored in the small closet of our spare room which also serves as our office, library, and sometimes mud room. My sweet husband seems to know what he has coming. He has a pretty good idea that one day in the near future the shared space will be a craft room. It just doesn't seem like I should have to move my sewing machine and all of my supplies to the kitchen table everyday. It would be great if I could give up cooking and turn the larger kitchen space into a craft room, but I like eating probably even more than I like crafting...so in all reality, that is not going to happen. Organization of materials. There really has to be a better way than storing supplies in old baby wipe containers. I need storage for fabric, scissors, buttons, scraps, ribbon, paint, book making supplies, ect. Now it is time to hear your ideas, I really need some inspiration. Looking online I have found some great ideas, here are some of my favorites. I found this great idea on everything etsy. This beverage cart is a great idea for utilizing a small space. I love the cork board on the inside of the door, but I think that I will definitely need additional storage space. I love the green/yellow/blue. Look under "Art Studio Inspiration" for more great ideas on their site. I love this color pallet. They did a good job of making the room feel very open and light. Most people think that red and green will automatically make their space feel very festive, but if the colors and chosen appropriately it can feel really fresh. I also really love the slotted board and shelf unit. That would be great for me, because I love to adjust my system of organization. I found this image on HG tv. I love the lighting in this red room, I also love the storage unit that is built into the workstation. I need something compact like this. I am very in love with the wrapping station on the wall. One day I am going to have a gift wrapping room, wouldn't that be a dream? Filing cabinets are also a must for my craft space. I need a much better system of organization for all of my receipts and invoices from my etsy shop. I have plenty of Mason jars, so that might be a great solution for storing some of my supplies. And how in the world am I going to get that great yellow chair. Check this and other great ideas out at Home Designing. I love this idea for many different reasons. 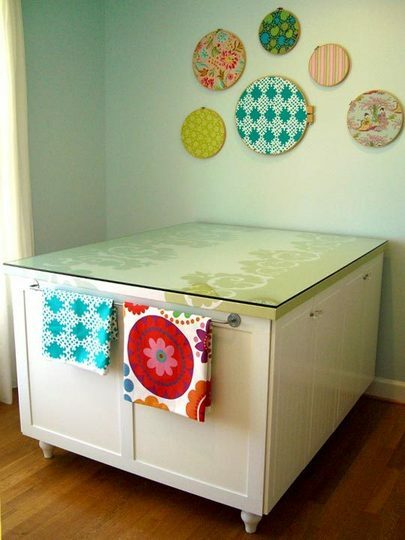 I love the glass top work space. It is beautiful isn't it. I love the pattern below it-I am not sure if it is painted or if it is fabric, but it sure is great. I also love the stretched fabric in the embroidery hoops. I think that fabric is SO great, and what a great way to display it. 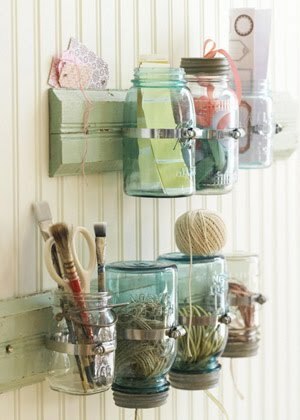 I heart beadboard, and this is one more way that I could use mason jars for storage. Okay who can guess what my favorite aspect of this room is? The clipboards. I have a lot of artwork that isn't framed and I think that this is a creative way of displaying images. I think that I must try this. The pegboard would probably by helpful as well. Let me know if you have any great organization solutions or ideas for my small shared workspace. sigh....I love all of those. I need to do something with my craft "corner" it is anything but inspiring! Awesome ideas! I just finished a new office/craft room desk set-up, but now I need the storage ideas for all the little stuff! For that square work table with the shelves on the sides, you should take a look at knock-offwood.com. 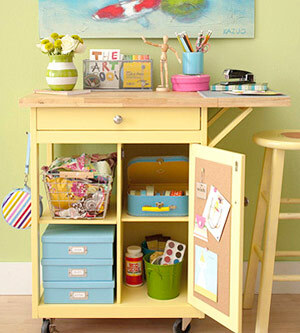 GREAT website, teaches us chicas how to build our own stuff, including that work table! 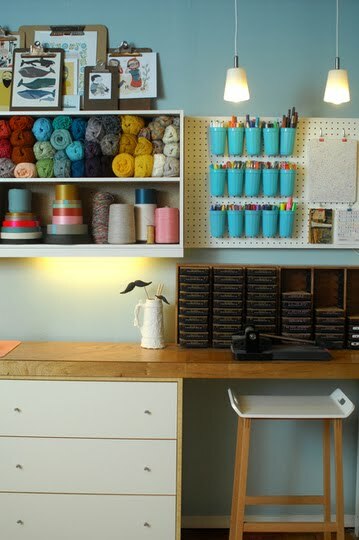 Nothing like well lit, organized images to inspire creativity, if not a sorting or cleaning spell! hoping for my 'own' space where no household tasks shift onto the surface.